Is there a new Disney Channel couple on the rise? Well, fans are sure hoping so after seeing Asher Angel and Jenna Ortega being all cute together for quite some time now! 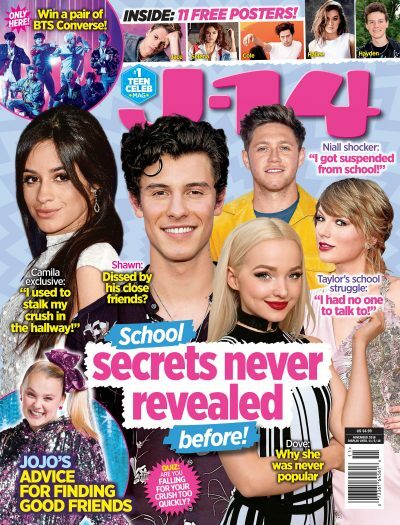 The 16-year-old stars have everyone wondering exactly what is going on between them, so we’re here to break down everything we know so far. Jenna and Asher rock coordinating couples costumes for Halloween. Asher and Jenna attended Just Jared‘s 7th Annual Halloween Party together where they posed on the red carpet holding hands, as they were dressed up as former couple Ariana Grande and Pete Davidson. OK, now they totally nailed these costumes! But a very couple-like thing to do, tbh. They attended a fashion show together. Not too long before this Halloween outing, they both were on hand at a fashion show, with Asher sharing a v glam pic of the pair together on his Instagram. They both posted about their hangout session on their Instagram Stories too, with Asher sharing a cute video of the pair posing together and wrote, “this one” with a red heart on the video. And he posted a cute selfie style video of the pair too, where he gave the camera a very cute smirk. Plus, they were hanging out with tons of other Disney stars at Universal’s Horror Nights, so clearly they’ve been spending a lot of time together lately. Before this, they made their red carpet debut at a movie premiere. Asher and Jenna attended the premiere of the movie Venom back in the beginning of October legit showed up together – and even posed on the red carpet side-by-side. They were, of course, all smiles hanging out together in their chic, all black outfits. The pair even posed alongside one another as they got their GIF action on. Plus, Asher took to his Instagram story to share a cute selfie video starring Jenna, who said she was so excited to be at the premiere. Notice that little blue heart the “Chemistry” singer put next to her name. Asher basically admitted he has a girlfriend. Well, these two could totally be just friends and nothing more, but we do know they’re both currently single and it’s easy to see that sparks might just be flying between them after all. While fans totally ship Asher and his Andi Mack co-star Peyton Elizabeth Lee, but they’ve made it clear they are friends and are basically like family. Jenna was once linked to singer Jacob Sartorius, after she starred in his “Chapstick” music video – but once again, they’re just friends. The 16-year-old “Sweatshirt” singer went on to date actress Millie Bobby Brown, before they called it quits back in July. Fans also wondered if Jenna and her Stuck In the Middle co-star Isaak Presley were an item IRL, seeing as they would often hang out together both on and off the set. You see, they played siblings on their show – and IRL, they have that same bro and sis bond! So perhaps something might be going on between Jenna and Asher, after all. They have known each other for a while now and hung out plenty of times before. We’ll just have to wait and see if a new love story is truly on the rise!